Comet C/2011 L4 (PANSTARRS) has been thrilling observers in the southern hemisphere for the past few weeks as it approaches its March 10 perihelion at a distance of 0.30 AU from the Sun. Over the next week, the comet will travel north and become visible (though still a difficult sight) for those of us north of the Equator. At discovery PANSTARRS appeared to be an intrinsically bright comet and many forecast that it would brighten to magnitude -1 or so. But as is common for dynamically new comets making their first trip through the inner Solar System, PANSTARRS’ rate of brightening slowed down. With the comet as close to the Sun and Earth as it will get it should not brighten further. Still at magnitude +1.5 it ranks as one of the brighter comets of recent times. The image below shows PANSTARRS in at its current best. The image is interesting in that it shows us a lot about this particular comet. First off, it is a brilliant yellow. Being a dust-rich comet, the dust it has released does a very good job of reflecting the light of the Sun, hence the yellow color. Its yellowness is also enhanced by the excitation of sodium atoms in the comet’s dust. This is especially true for comets that have perihelia at small heliocentric distances. The other thing to notice in the image below is that PANSTARRS has three separate tails. The most obvious is the broad dust tail extending towards 11:30am position from the head of the comet. This tail is composed of dust released by the comet over the past few weeks. 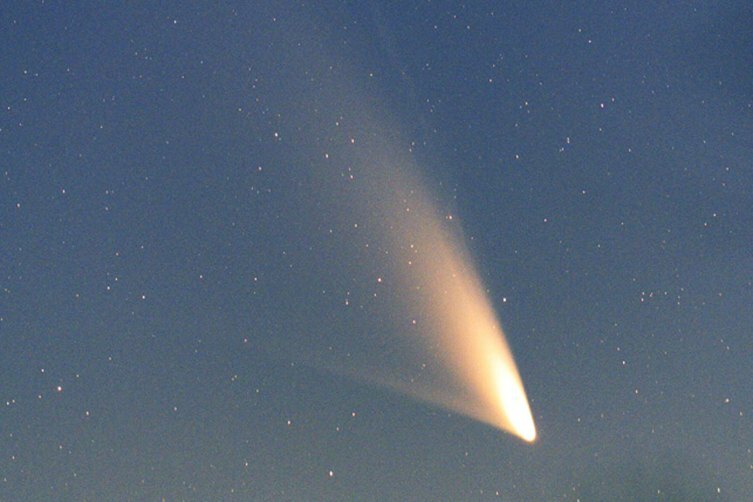 The narrower dust tail extending towards the 9:30 am direction is composed of larger dust particles that were released by the comet over the past few years. It is very possible that some of this larger dust may even have been released before the comet was discovered when it was located 10-20 AU from the Sun and activity was driven by highly volatile ices. The third tail is the hardest to see. It is easiest seen near the top of the image as a thin long tail just to the right of the main dust tail. This faint thin tail is the comet’s gas or ion tail. Its faintness is a clear indication that PANSTARRS is not a very gas-rich comet. Note, that the gas tail is usually bluish in color so it is not as easy to see in a bright (and blue) twilight sky compared to the yellow dust tails. Comet PANSTARRS seen from Queenstown, New Zealand, on Mar. 2, 2013. Credit: spaceweather.com, Minoru Yoneto / AP . Though observers down under have had the comet all to themselves the past few months, PANSTARRS is now rapidly moving north. Last night I tried to spot the comet during bright twilight with 10×50 binoculars here in Tucson with no luck (latitude 32°). Also Salvador Aguirre was unsuccessful in his naked eye attempts to spot the comet from Hermosillo, Mexico (latitude 29°). The northernmost observations that I know of is from Malaysia (as reported by Spaceweather.com) (latitude 5°). The lack of northern observations should change rapidly. Luckily for us, the Moon will be well placed to point the way to the comet next week. 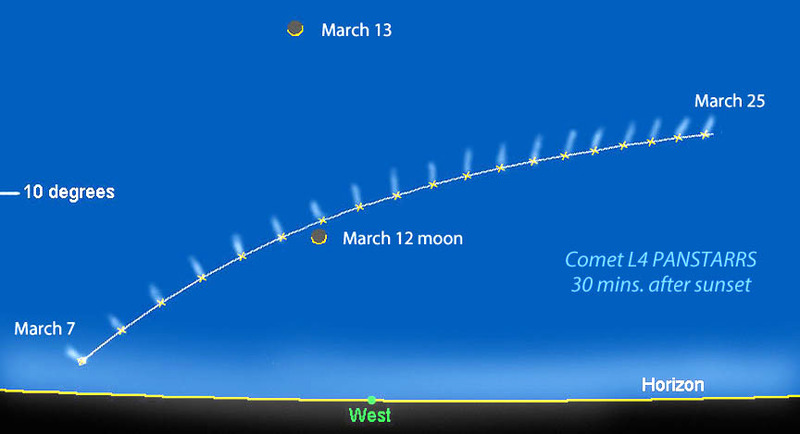 On the evening of March 12, the comet will be located within 2 to 3° to the left of the Moon. Even then this will be a very difficult observation. A clear unobstructed view of the west horizon is a must as the two will be only a few degrees above the horizon. Also binoculars are highly recommended as even the Moon will be very difficult to find due to its thinness, faintness, low elevation and the brightness of the sky. Over the next few weeks the comet will slowly appear higher in the sky though it may not be till early to mid-April till we see a nice view of the comet in a dark sky. By that time the comet will have faded to a faint naked eye object (for folks under dark skies, city folks will likely have to rely on binoculars to spot the comet by then). The finder chart below was produced by Bob King (‘Astro Bob’). Comet L4 PANSTARRS keeps low to the horizon when its brightest from early to mid-March. The map shows the comet’s position and approximate tail direction each night from March 7-25 about 30 minutes after sunset from the mid-section of the U.S. (around latitude 42 degrees N). Created by Bob King with Chris Marriott’s SkyMap software. As impressive as the comet appeared in the first image above, to the naked eye it should look more like the image below. 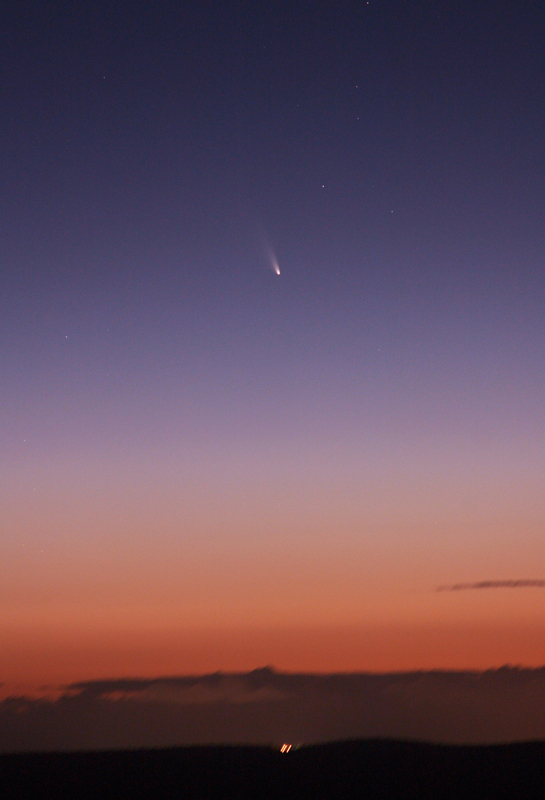 Comet C/2011 L4 PANSTARRS as seen from Mount Dale, Western Australia. The lights on the distant horizon are from the city of Armadale, which is southeast of Perth. Image credit: Astronomy Education Services/Gingin Observatory. Hello Dr. Hergenrother. My name is Bill, and I have a question. Is there a website or websites one can go to to find out when a particular object or objects, a planet such as Jupiter, for example, is going to be in a particular part of the evening sky, such as in a constellation, say for example, Taurus or Aries, or does one have to purchase some sort of computer program in order to be able to find such information? Thank you. On friday march 15th, our astronomy club organizes a public observation session of the Comet Panstarrs in the neighbouring town of Folgensbourg (Alsace, northeastern France). I’ll try to shoot a few pictures from there… if the weather does us a favor !